The Seed Conservation team undertakes research into theoretical and applied aspects of seed biology, physiology, and ecology. This research aims to advance the underlying principles of seed biology and translate these into technologies for plant propagation, conservation, and landscape restoration. Seed Conservation supports the Western Australian Seed Technology Centre which plays a vital role in conserving WA’s biodiversity through the long-term storage of seeds. Research focuses on seed collection, quality assessment and control, seed banking, seed germination and dormancy, and techniques for improving seed delivery and seedling establishment at restoration sites. Seed ecological research aims to understand the role of seeds in shaping the establishment, reproduction, and persistence of plant species and communities. The Seed Conservation team collaborates with national and international partners, including other state botanic gardens and the Millennium Seedbank, Royal Botanic Gardens, Kew, UK, and works closely with Western Australian universities, the mining and agricultural industries and landcare groups to ensure research outcomes are disseminated to the wider community. Please contact Dr David Merritt with enquiries relating to Seed Conservation. The WASTC has been involved in the collection, storage and testing of Western Australian native plant seed for over 40 years. Innovative seed technologies for restoration in a biodiversity hotspot. The Restoration Seedbank Initiative (RSB) is a major five-year, multi-disciplinary project focussed on restoration in Pilbara region. Smoke holds the key to germination for many native Australian plants. 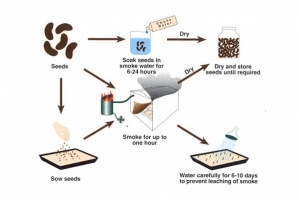 Research into smoke-derived products (karrikins) that promote seed germination. Research into the energetic basis to seed longevity and storage. Integrated conservation of the threatened species Androcalva perlaria (syn. Commersonia sp. Mt Groper). Integrated conservation of the threatened banded ironstone species Ricinocarpos brevis (Euphorbiaceae).